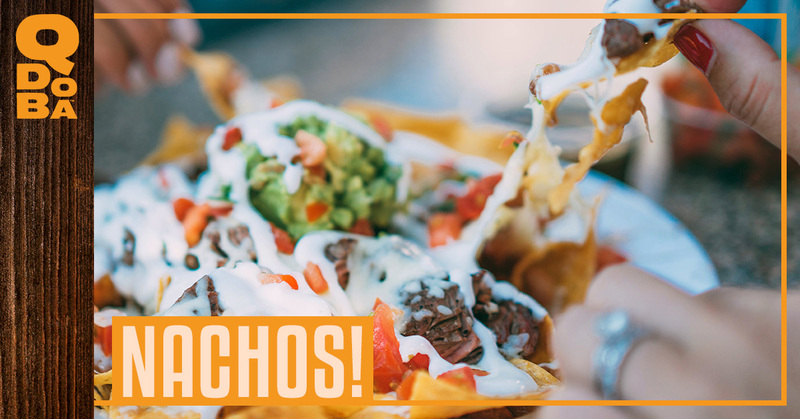 Yell “Nachos!” into any crowd, and you had better get out of the way! This is especially true if your guests or employees know that there is a Hot Nacho Bar from Qdoba waiting for them! Qdoba can bring Mexican catering services to your Laramie party, office, or church event and make your guests or employees happy with our Hot Nacho Bar. Handmade tortilla chips, of course! These are no ordinary chips; these are Qdoba chips that are always fresh and crisp with just the right amount of salt on them. Meat options! If nachos aren’t nachos without meat, we’ve got you covered. You can choose between marinated grilled chicken or perfectly seasoned ground beef. If you prefer your protein from beans, or you like to boost your meat protein, or you just crave the mingled flavors, you can choose from black or pinto beans. Nachos aren’t nachos unless they are smothered in cheese, right? Well, our Hot Nacho Bar won’t disappoint! Our famous Qdoba 3-Cheese Queso is available for you to indulge in. Once you’ve got the bones of your nachos with chips, meat, beans, and cheese, it’s time to dress them up! Get your flavor kicks with the salsa. You can choose from Salsa Rojo (hot), Salsa Verde (medium), or Pico de Gallo (mild). When it comes to salsa, you get the opportunity to customize your heat and flavor. Mix the salsa on your nachos to give yourself the mix that is just right for your taste buds! Top off your nacho plate with sour cream and our hand-smashed guacamole. Order your catered Qdoba Hot Nacho Bar and prepare to get out of the way!